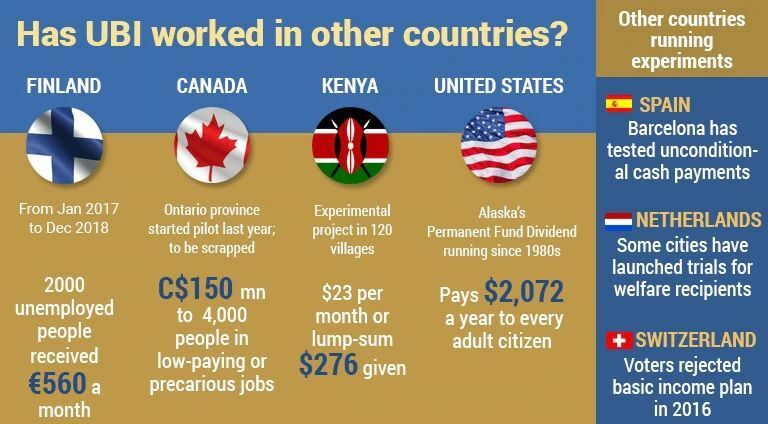 Universal Basic Income (UBI) is a model for providing a sum of money to all citizens of a country or other geographic area with a given sum of money, regardless of their income, employment status. The purpose of the UBI is to prevent or reduce poverty and increase equality among citizens. In the Economic Survey 2016-17, Finance Minister Arun Jaitley advocated Universal Basic Income scheme (UBI) in place of various social welfare schemes in the country, in an effort to reduce poverty and income inequality in the country. Economist Suresh Tendulkar had recommended a minimum of Rs. 7,620 per person / year to the poor people of the country to avail the nutritional food or come out of poverty line. Therefore, the NDA Government is planning to give a minimum of Rs.7,620 per person / year to 75% population of the country. The estimated cost of the Universal Basic Income scheme could be around 4.9% of GDP. 1. Universal Scheme: UBI is a universal scheme in nature. It means UBI is not targeted so all citizens of the country will receive the payment of cash without any discrimination. 2. Periodic: Money will be distributed to the beneficiaries at a fixed interval i.e. monthly/yearly. 3. Cash Payment: The beneficiaries will get the cash directly into their account. So they won't get anything in kind of cash i.e. vouchers for goods or services. 4. Unconditional Scheme: It means one need not prove his or her unemployment status or socio-economic identity to be eligible for UBI. So social or economic positions of the Beneficairy/individual are not taken into consideration. 5. Individual Beneficiary: In this scheme each citizen (or adult citizen) is considered as the beneficiary rather than each household. 1. UBI will be a landmark scheme in reducing inequality and eliminating poverty in the country. 2. UBI will increase the purchasing power of the poor section of the society so the aggregate demand in the economy will be high which will further motivate to producer for more production and more investment. 3. It will ensure security and dignity for all individuals in the country. 1. Currently government provides services through various social welfare schemes but now government want to change this trend by giving them cash so that peoples can buy services/goods of their choice. 2. UBI will provide secured income to individuals. 3. The scheme will reduce poverty and income inequality in the society. 4. It will increase the purchasing power of every poor so aggregate demand in the economy will get boost. 5. It is easy to implement because government need not to identify the beneficiaries which is very tough task for State and Central Government. 6. This scheme will reduce the wastage of government money because its implementation is very simple. 1. There is strong possibility that free cash to poor can make them lazy or it may reduce incentive for work. 2. There is no guarantee that the given cash will be spent on the productive activities, health & education etc. It may be spent on tobacco, alcohol, drugs and other luxury goods etc. 3. Free cash to the people will increase the rate of inflation in the economy. 4. It may be that worker can refuse to work (as it had been observed in case of MGNREGA) as a labourer or demand higher wages which can increase the cost of production of agricultural goods. In the conclusion it can be said that history has proven that freebies never changed the economic conditions of the people. So giving a sum of Rs.7,620 per person / year will not change much as we have seen this in the MGNREGA schemes which gives Rs. 10,000 per year to the people. So government should focus to increase the skill of the people at free cost rather than free cash. How to link your Aadhar with PAN Card? How Poverty Line is Determined in the Indian States? What is the Meaning and Purposes of Deficit Financing? Why Rupee is falling against Dollar currently? What is the cost of EVM in India and where it is built? What is a Tidal Bore? 3058 Views What is Money Laundering and how is it done? 2828 Views What are Grey List and Black List of the Financial Action Task Force?